Because God loved us first. Even when we disagree and argue. So that the world will know about God’s great love. As we worship and serve God together. Loving God, we have given more weight to our successes and our happiness than your will. We have eaten without a thought for the hungry, spoken without an effort to understand others, kept quiet instead of telling the truth, and taken the gifts you have given us for granted. Forgive us and help us to live as disciples of Christ. In Jesus’ Name we pray. Amen. Gracious God, we thank you for this meal and for all of the ways you nourish us. Grow in us that we may nourish others. Sustain us as we journey out into this new year, sharing your love and your light with the world. Since that day, more than $143 million has been raised for local charities across the country through Souper Bowl of Caring. It has become a powerful movement that is transforming the time around the Big Game into the nation’s largest celebration of giving and serving. Through this mission, young people learn what it’s like to make a positive differnece in the world—as they collect food, raise money, and volunteer to work in charities that provide shelter to the homeless, food to the hungry, and compassion to those in need. Be part of this movement that is sharing God’s love with those in need. After worship today, our huddlers will be serving soup that they made and collecting donations for the Souper Bowl of Caring. Thank you in advance for your generosity. 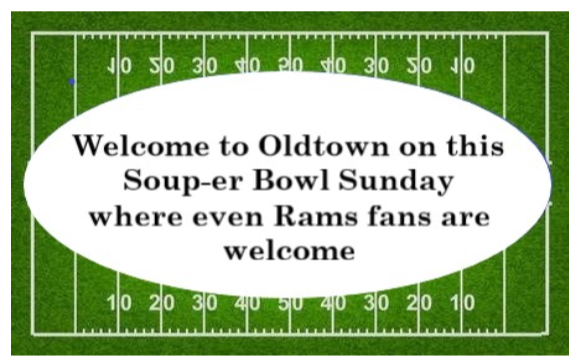 our 2019 Souper Bowl of Caring charity of choice. Mark, Ed, Sue, Steve, Kerri, Cindy, Gordon, Kristen, Susan, Fran, Maryam, Meena, Marjon, Brooks, Steven, Joseph, Perilene, Cyndy, the Brauneis family, the Scott family, Claire, Christina, Susan, Rosalyn, Denise, Jay, Dylan, Shane, Teri, Jonathan, Valerie, Lisa, the family of Neil Gagne. Join us on Tuesday for Coffee Connection! Coffee Connection is a simple time of fellowship to get out of the house and spend time with friends. Thanks to all who helped with our first Take-Out Turkey Supper. We are always grateful for the hard work done by our congregation and for the new ideas for fundraising!